Exxon Climate Change Cover Up: What Did Exxon and CEO Rex Tillerson Know and What Did They Do About It? Dimitri :	This is Dimitri Lascaris for The Real News. In 2015, investigative reports by Inside Climate News and the Columbia School of Journalism revealed that Exxon had known as early as 1968 about climate change risks, and that it had misled its shareholders and the public about those risks. In November 2015 following these revelations, New York’s attorney general Eric Schneiderman launched an investigation under states securities and consumer protection laws into whether Exxon properly disclosed those climate change risks. Schneiderman issued to Exxon a subpoena seeking decades of records related to Exxon’s history of research into and knowledge of climate change. Nine months later, Schneiderman expanded his investigation by issuing a subpoena to Exxon’s auditors, PriceWaterhouse Coopers. The accounting firm, which has expertise in climate related risks faced by fossil fuel companies, has remained neutral in the legal fight, but has honored Exxon’s request not to turn over documents pending the outcome of litigation over those documents. In 2016, the attorney general of Massachusetts, Maura Healey, joined the investigation against Exxon. Earlier this week, there was a significant development in the New York State investigation. A New York State Appeals court dismissed Exxon’s appeal from a lower court decision upholding Schneiderman’s subpoena to Exxon’s auditors. Exxon had asked the lower court to quash the subpoena on the basis that under the laws of Texas, where Exxon is head quartered, communications between Exxon and its auditors are privileged. To discuss the latest development in this investigation, we are joined by one of the investigative journalists who first broke the story, David Hasemyer from San Diego. David is a reporter with Inside Climate News. He is also a co-author of, “Exxon, the Road not Taken,” which was a 2016 Pulitzer Prize finalist and winner of the John B. Oakes Award for distinguished environmental journalism. He also co-authored, “Dilbit Disaster, Inside the Biggest Oil Spill You’ve Never Heard of,” which won the 2013 Pulitzer Prize for national reporting. Welcome to The Real News, David. David Hasemyer:	Dimitri, thank you. It’s a pleasure to be here. Dimitri :	David, I’d like you to start by explaining to us briefly what prompted your investigation into Exxon, and what that investigation broadly speaking revealed about its knowledge of climate change risk and its concealment of those risks? David Hasemyer:	It was simply a matter of, at a staff meeting, kind of tossing out all sorts of ideas and questions. Then one of the questions became, what did the oil and fossil fuel industry understand about the potential of climate change based on rising atmospheric CO2, because of the burning of fossil fuels. We just were just kind of noodling. How far back did they know this? Were they thinking about it? Myself, my colleagues Neela Banerjee, Lisa Song, and Jack Cushman, simply starting asking questions of scientists, of researchers. We ultimately learned that in the mid 1970s, Exxon had indeed began its own research. That lead us to track down some of the scientists, some of the people involved, and we learned that in 1977, Exxon was warned by some of its own researchers that burning fossil fuels was a contributor to rising atmospheric CO2. Four years later, another Exxon scientist warned that that rising atmospheric CO2 could have catastrophic consequences in terms of global warming. From there, our investigation simply took off. Reading reports, knocking on doors, and talking to people. Dimitri :	What are the principal most damning pieces of evidence that Exxon received that advice from its own experts? David Hasemyer:	What you see being cited by the attorneys general of New York and Massachusetts, Eric Schneiderman and Maura Healey, are some of those early documents where Exxon was warned by its own scientists that there was a risk of global warming and climate change because of the burning of fossil fuels. I think the investigators are also going to be paying a lot of attention to how Exxon, and truly the fossil fuel industry, responded to those warnings. In the 1980s, they went on a campaign to discredit climate scientists, to essentially discredit some of their own science and their own findings. I think the two attorneys generals will want to see those documents. It’s kind of the old Watergate-esque question. What did Exxon know and when did it know it, and the added question of and then what did it do? Dimitri :	What specifically is the New York State attorney general seeking from the auditors? What in your view might those documents reveal? David Hasemyer:	We know from looking at the subpoena issued to PriceWaterhouse Coopers, by the New York attorney general, that they are looking for any discussions, any internal discussions between Exxon and its auditors about how potential climate change could affect their financial well-being, their bottom line in other words. In the subpoena itself, it doesn’t lay out what may be in those records. But I’ve had the opportunity to talk to a number of forensic accountants, former FBI agents, who have done financial fraud investigations. What they tell me is that an auditor will often have a very frank conversation with its clients in which it will challenge its client’s findings. In this case, what Schneiderman may be looking for according to these forensic experts, is how Exxon explained to PriceWaterhouse Coopers its conclusions related to its assessment of climate risk. Dimitri :	Now the current secretary of state in the Trump administration, Rex Tillerson, joined Exxon in 1975 and served as its CEO for ten years from 2006 to 2016. He has spent virtually his entire career at Exxon. Based on the evidence you have seen thus far, to what degree does he appear to be implicated in all of this? David Hasemyer:	I think that’s the question that Schneiderman and Healey are trying to answer. Mr. Tillerson has for a long time acknowledged climate change, acknowledged the role of fossil fuels, burning of fossil fuels in climate change. I think what they’re going to want to know is what Tillerson did and what Exxon did proactively. Because Exxon is saying, “Look, for the last decade or more we have acknowledged climate change.” I think what the investigators want to know is, what did you do about it? Did you invest the same amount in lobbying? Did you invest the same amount in public relations that you invested early on in trying to deflect the climate science? 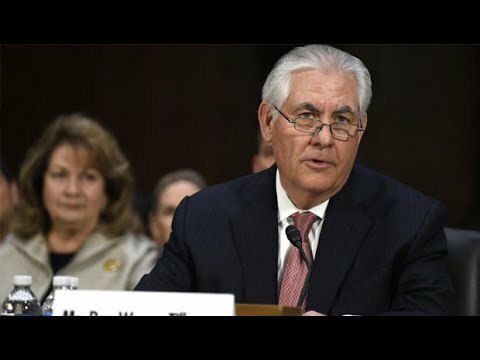 Dimitri :	Now I understand that Mr. Tillerson used an alias for certain internal emails at Exxon. Also, that there’s a gap in the email record that Exxon has produced to the New York State attorney general. What is that all about? David Hasemyer:	As part of its early compliance with the subpoena by the New York attorney general’s office, Exxon began turning over records that included emails. The New York attorney general’s office discovered that in addition to Rex Tillerson having his normal Exxon email account, he also had a second account. It was on the Exxon server. It was an Exxon email, but it wasn’t his usual [email protected] It was [email protected] Exxon’s explanation for that is that that secondary email account allowed Tillerson to escape the daily barrage of emails that he got to his normal email account. It allowed him to have a means to communicate with his corporate executives on things that may have pertained to very sensitive Exxon issues, as well as to climate change. Dimitri :	This gap, which I understand is of a period of three weeks, has the company offered any explanation as to why this gap exists? David Hasemyer:	The company’s explanation is that there was a technical glitch. Essentially the Exxon email server, the Exxon IT folks had built in an automatic delete system, which is common I think in large corporations and companies just to clear the clutter of emails. What happened, according to Exxon’s explanation, is that once it became known that there was a subpoena, they put a hold on the Rex Tillerson main account, a legal hold on them. In fact, Exxon’s explanation is that they automatically put holds on their primary executive accounts just in case somebody, you know, wants to look at them. What they didn’t do because they forgot there was this outlier email under Wayne Tracker, they forgot to put or disable that automatic delete system. Exxon’s computer system simply went through and started automatically deleting old emails. That’s the explanation that Exxon has offered. Dimitri :	In essence they’re claiming that they forgot about the email account that Mr. Tillerson used for the most sensitive Exxon related communications. David Hasemyer:	What they are saying is that their computer program saved his Rex Tillerson emails, but the computer wasn’t programmed to save the Wayne Tracker emails. The IT folks simply forgot about, or were unaware of the secondary email account, and so did not put a hold on that. Dimitri :	Right. Recently, we all know that Exxon has its share of friends in office. One of them being Republican congressman, Lamar Smith, the chair of the congressional science committee. Who remarkably has issued subpoenas to the attorneys general of New York and Massachusetts in relation to their investigations into Exxon. You know, there’s a certain irony to this because you know, Exxon is invoking a privilege which purportedly attaches to its communications with its auditors, a much more ancient and well-establish privilege is the one relating to lawyers and their clients. Here we have, you know, a friend of Exxon in congress, Lamar Smith, sending subpoenas to the attorneys general of New York and Massachusetts seeking documents which may reveal sensitive aspects of their investigation and their thinking into how to conduct their investigation. What is congressman Smith’s justification for issuing those subpoenas, and how have the states reacted to them? Dimitri :	There has been a reaction, apparently, from other state attorneys general, is that right? Dimitri :	Ultimately in your view, what is potentially at stake in all of this for Exxon and Mr. Tillerson? David Hasemyer:	You know, you have to kind of look at it minimum and maximum. The minimum may be, and we don’t know this and that’s the heart of this investigation being conducted by these two attorneys generals, is to find out how Exxon calculated climate risk into its business model, and then how it portrayed that to potential investors and to investors. Did Exxon disclose enough information that allowed those investors to make reasoned decisions to invest in Exxon? There could be anything from Exxon being required to go back and file updated disclosures with the SEC, to you know, facing several penalties imposed by statutes of both states. Dimitri :	Well this is shaping up to be an epic legal battle, in which I suspect there are going to be many twists and turns, and I hope David that we can have you back to discuss the case as it evolves. David Hasemyer:	Certainly. It would be my pleasure. Dimitri :	Thank you very much for joining us today. This is Dimitri Lascaris for The Real News.